I always considered our lives very blessed. We always get what we want and we have constant love, care and support from our family. What more can we ask for? But God is amazing. I came home one day after work and found a few bright yellow round things in our garden. My first thought was : someone has been throwing tennis balls into our backyard? haha But when I got a closer look, they were lemons that fell off our neighbour’s lemon tree! (: The winds and rain were so strong, the lemons flew into our backyard! What blessings! Showers of blessings indeed! 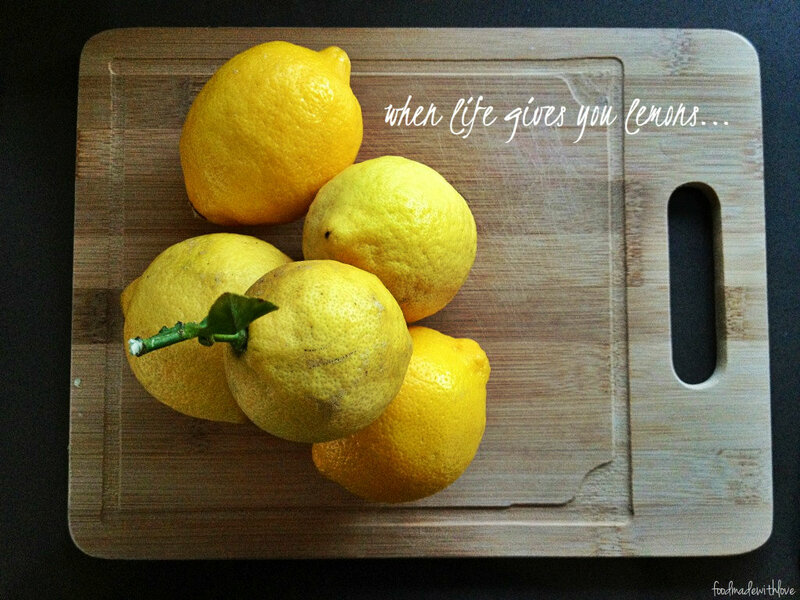 So what do you do when you suddenly have a whole bunch of lemons? 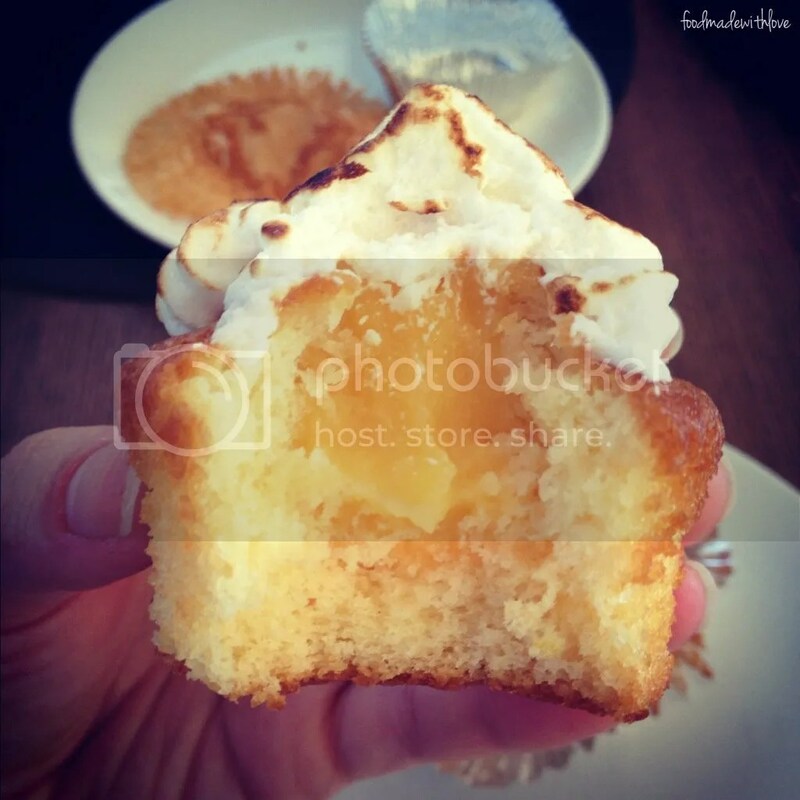 Make lemon meringue cupcakes filled with luciuus and tangy lemon curd, of course! It’s been a cupcake I have been wanting to make for the longest time. Ever since the first Junior Masterchef when Isabella made her beautiful cupcakes for the Mystery Box challenge! So I decided to make the curd a day before, and wake up early on a Saturday morning to make these gorgeous small cakes. I started bright and early, so much so that I could try two cake recipes! I was drawn to the recipe on Gourmet Traveller (September 2011 Issue) that was from the Rockpool Bar & Grill. So I couldn’t resist making them. I just had to make both cakes. They were very different. Not just in the type of ingredients used, the way it’s made and also the texture. The cakes using Isabella’s recipe turned out soft and fluffy. But the ones from the Rockpool’s recipe turned out slightly denser and gooey-er (see above). I really couldn’t choose between the two! Both were delicious! 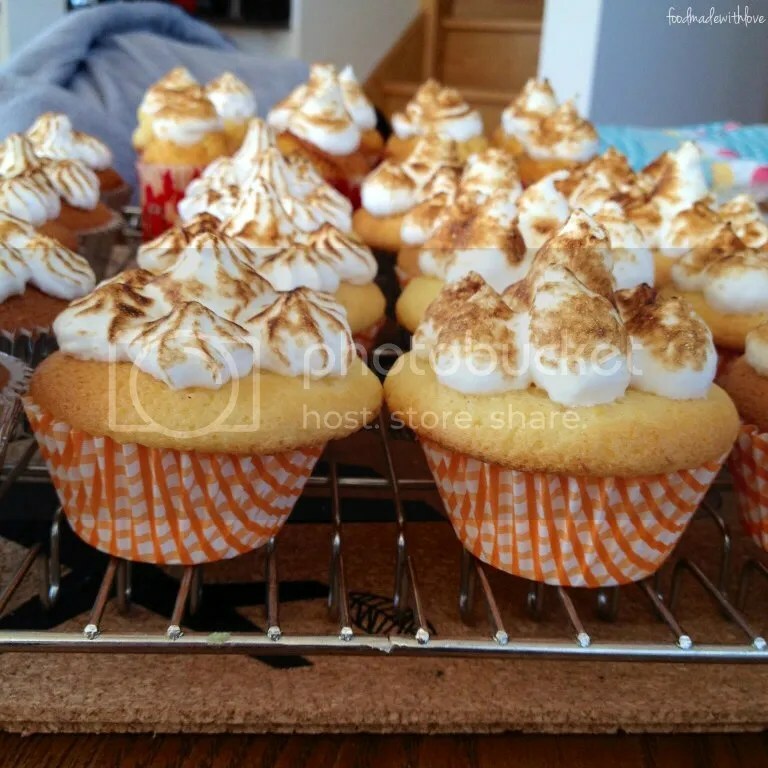 *Note : I used the same lemon curd and Italian meringue for both cupcakes and the recipes below are more than enough for all the 24 cupcakes made (12 from each cupcake recipe). 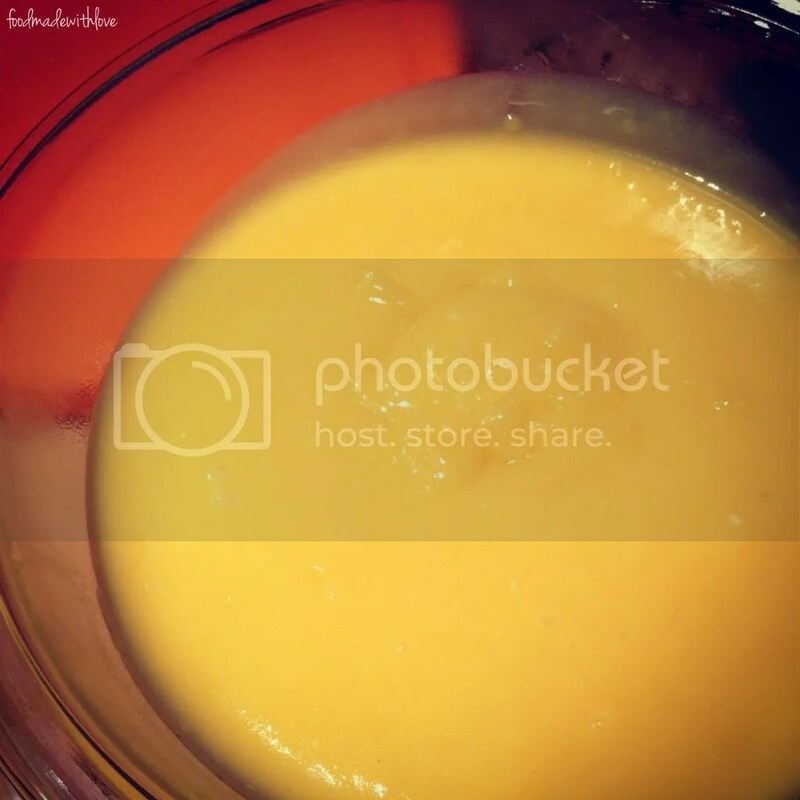 1) For the lemon curd : Whisk the eggs in a large bowl, then strain them through a sieve. 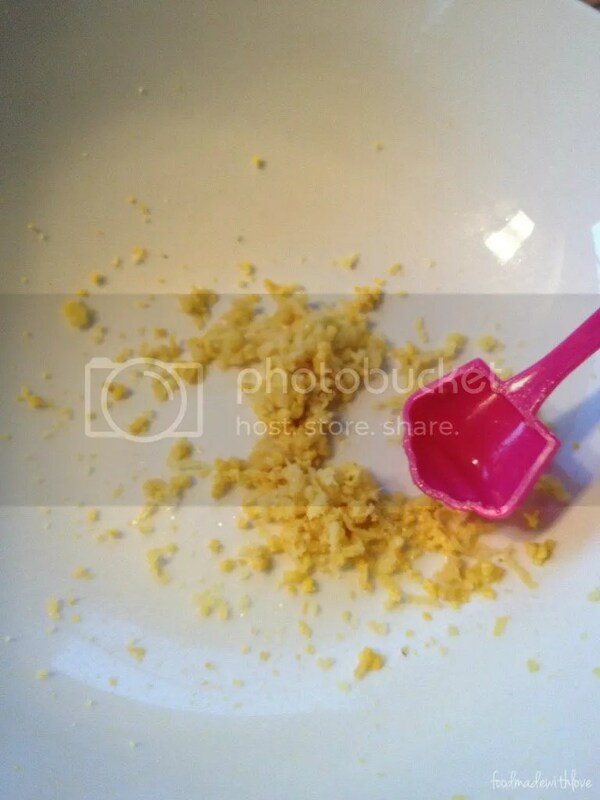 In a heavy-based saucepan, add the butter, lemon juice, sugar and zest. Stir until the butter is melted and sugar is fully dissolved. Add a little of the lemon mixture to the eggs to warm it up, then gradually add it back into the saucepan, stirring continuously. 2) Cook the mixture over low heat, stirring continuously and scraping the base of the saucepan until it thickens and coats the back of a wooden spoon. This will take about 8 minutes and make sure the mixture doesnt boil or else it will curdle. Allow the mixture to cool completely, before covering it and put it in the fridge until it is chilled. (At least an hour, but I prefer to make it a day before, and let it chill overnight). This is enough for the 24 cupcakes I made, and leftovers could be kept in an airtight container in a fridge, up to 2 weeks. 4) For the Italian meringue : Combine the caster sugar and water in a small saucepan over medium heat and sitr the mixture until the sugar has completely dissolved. Increase the heat to medium-high, and allow the sugar mixture to reach a soft-boil stage, without stirring (about 121 degrees celcius on a candy thermometer). 5) In a mixer, whisk the egg whites with the cream of tar tar until soft peaks form. On medium speed, slowly and carefully pour the hot sugar syrup into the whipped egg whites. Continue to whisk the mixture on medium speed until the mixing bowl feels cool, and the egg whites are thick and glossy. Fill a pipping bag and use immediately. 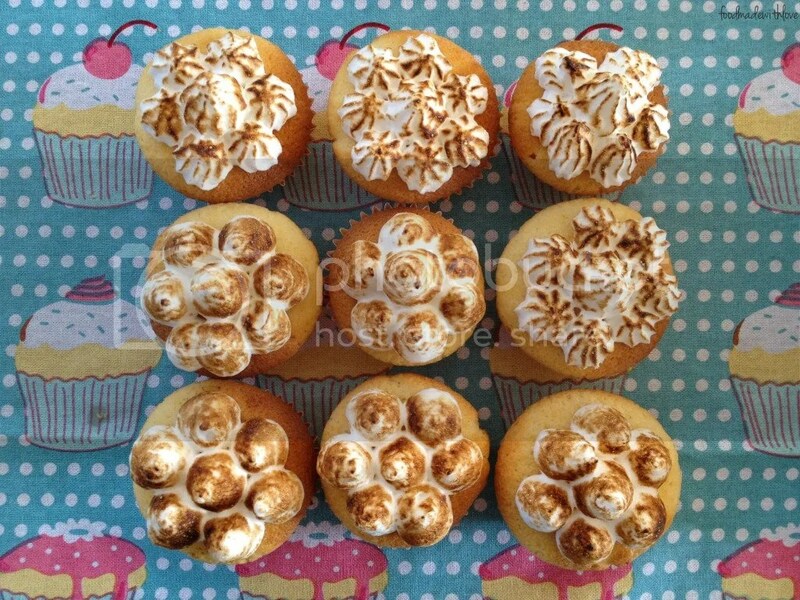 6) To assemble : Cut a whole in the middle of the cupcakes, big enough to fill 2 tsp of lemon curd. Fill a pipping back with the lemon curd and gently fill the holes up. 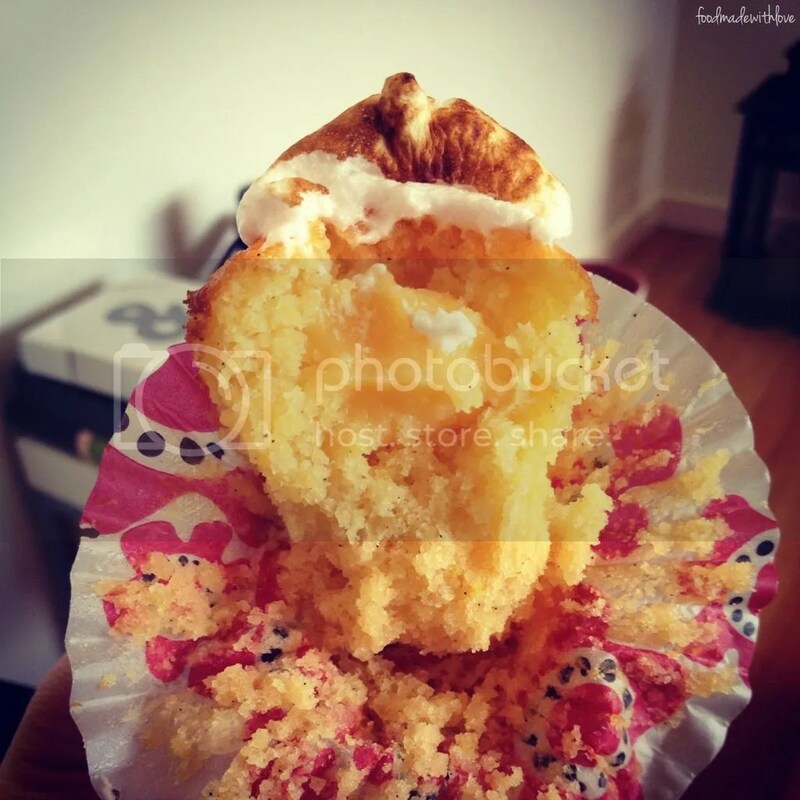 Pipe the Italian meringue onto each cupcake, making sure you cover the curd completely. 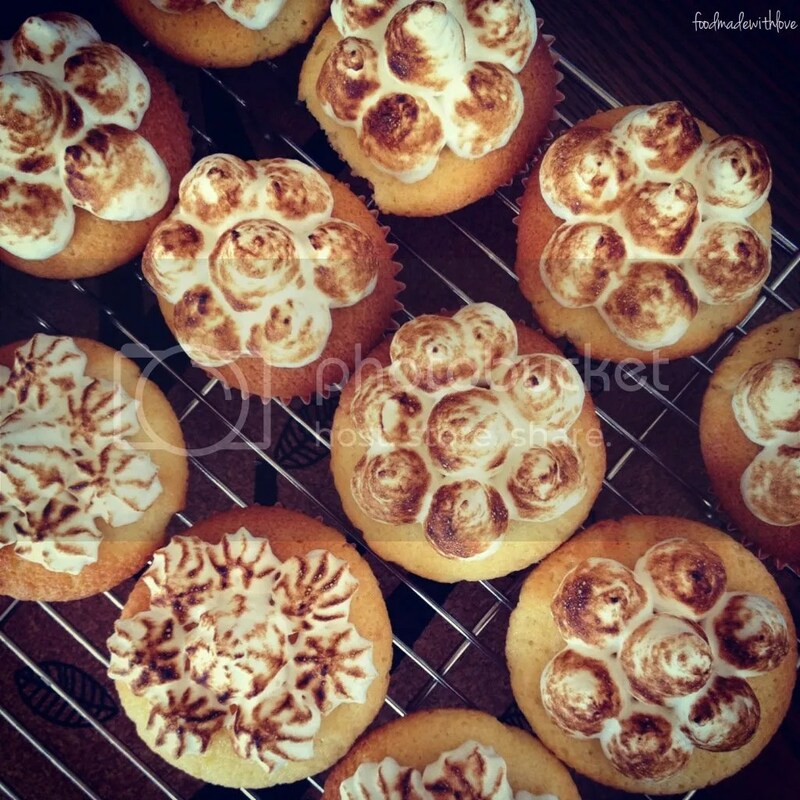 Using a kitchen blowtorch, carefully brown the meringue before serving. 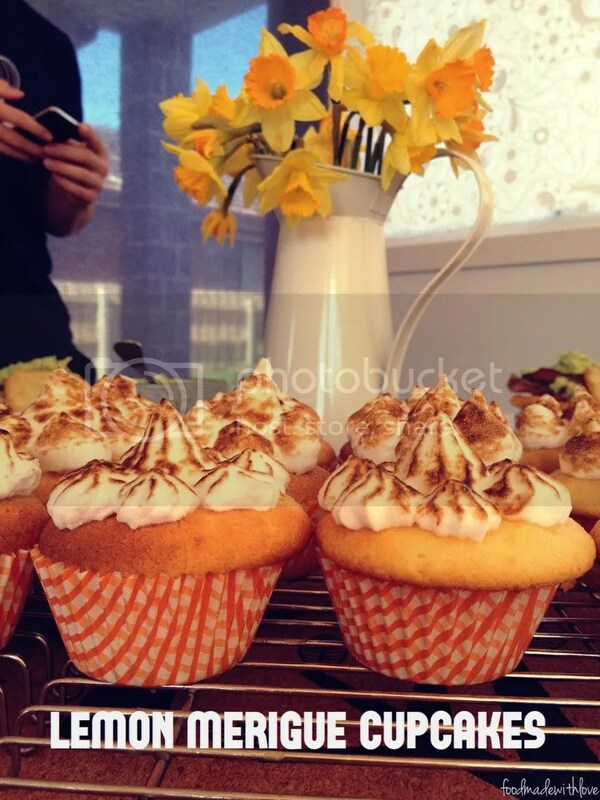 1) For cupcakes* : Place cream, sugar and eggs in a mixing bowl and whisk until smooth. Gradually add the flour (1/2 cup at a time) and zest and continue to whisk until thick and smooth. Spoon the mixture into the cupcake liners and bake for 15-18 minutes. Turn over on a wire rack and allow it to cool completely before filling them up with the lemon curd and topping with the Italian meringue (recipe and steps as stated above). *squeal* This is by far the cutest set of cupcakes that I’ve ever seen! I don’t have a blowtorch but I’d be keen to try out Isabella’s recipe since the no butter factor sounds really appealing 😛 And what a blessing indeed to have lemons ready for your use :). Have a great week, Lianne! Would you believe I’m making a pavlova with lemon curd right now? Glad it’s not far off, you are making me hungry for lemon meringue pie! haha what a coincidence! (: hehe the mr loves pavlova too! hehe think I have to make him one soon! esp since I’ve got leftover lemon curd in the fridge! hehe noms!